Weiss' story begins in 1882 in the confectionery capital of Saint-Etienne. It was all down to creator and pioneer Eugene Weiss who discovered the art of praline, and with his talent for blending, created Le Haut Chocolat. 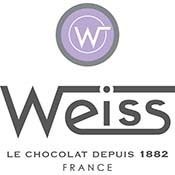 To preserve this unique artisanal tradition and expertise, Weiss today maintains complete control over the entire production chain, from selecting the finest ingredients such as cocoa beans, hazelnuts, and almonds, to creating luxury boxes of chocolate bonbons. They never stop innovating with and for their treasured clientele. At Weiss, they source the best to create the best. Weiss aims to keep its ingredients as natural as possible, and never adds any vegetable fat other than cocoa butter. The quality of their products depends on this as well as where these ingredients are sourced. Weiss has selected the best terroirs around the world to source its fruits, nuts, spices, and cocoa beans, for their unrivaled flavors and textures.